The MP SpinPrep offers you super flexible prep in a compact personal package. This centrifuge system is compatible with most rotors from current manufacturers, including Beckman Coulter, without the need for adapters providing your lab with significant cost savings. This benchtop centrifuge is easy to set up through a large digital display, where users can select the appropriate speed, timer setting, and direction needed for their samples. This lab centrifuge is ideal for biology labs working with plant and animal tissue, yeast and bacteria, wastewater, seeds and roots, and food. 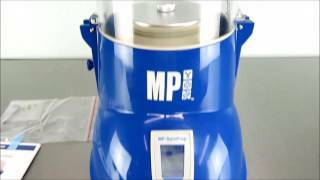 The MP Spin Prep has speeds up to 12000 RPM and a g force of up to 15000 x g, and can be timed up to 1 hour. This MP SpinPrep has been thoroughly tested and is performing to expectations. All of our lab equipment comes backed with our standard warranty. Should you have any questions, please don't hesitate to contact us.